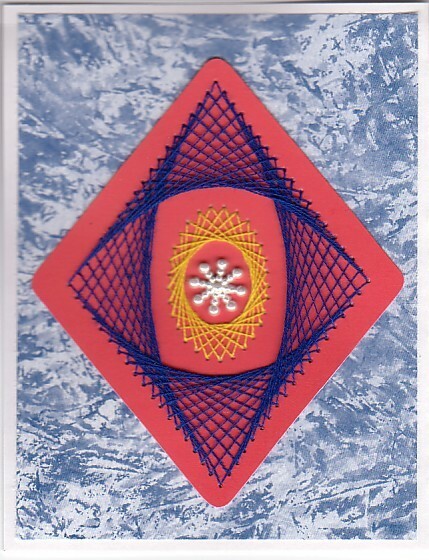 This diamond shaped embroidery pattern makes a colorful Christmas card. Diamond: Start at any point. Count clockwise 19 holes and stitch down (this should be one hole past the next point). *Count clockwise one hole and stitch up. Count counter-clockwise 19 holes and stitch down, clockwise one, stitch up, clockwise 19 holes and stitch down. Repeat from * until all holes have two stitches. Center oval: Stitch up in any hole, *count clockwise 8 holes and stitch down. Count clockwise 1 hole and stitch up. Count counter-clockwise 8 holes and stitch down, count clockwise 1 hole and stitch up. Repeat from * until all holes have two stitches.